The conclusion to HBO’s Game of Thrones is almost here, and a new teaser trailer titled “Crypts of Winterfell” has been released. Along with the teaser, we get the exact release date of the premiere, which will land on April 14, 2019. 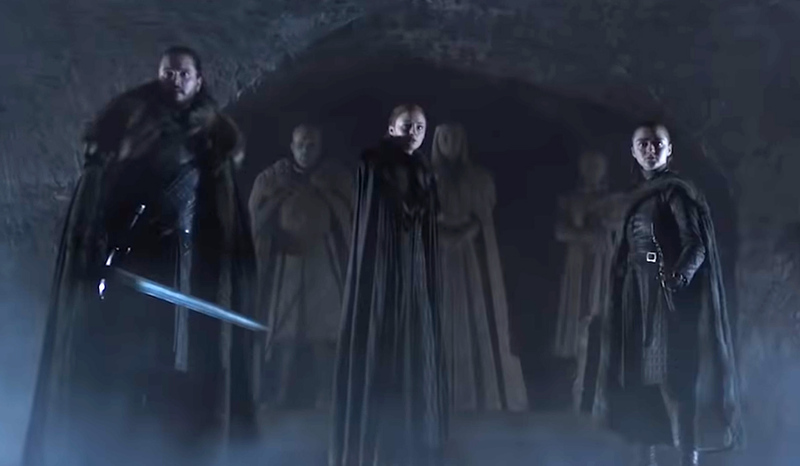 The teaser trailer features the Stark family, giving many fans what they’ve been waiting for, an epic moment with Jon Snow, Arya Stark and Sansa Stark coming together to battle whatever lies ahead of them. As they’re walking, we can hear their parents, Ned and Catelyn Stark, in the background talking about their lineage. The cold begins to creep up on them, letting us know that winter is coming. Game of Thrones Season 8 and final season will only have six episodes, so it’ll be the season with the least amount of episodes. (Season 7 had 7 episodes.) However, the episodes will be longer, which will be about 90 minutes long. That’s like watching six feature-length films. In the last season, audiences finally get the reveal that Jon Snow is the son of Rhaegar Targaryen and Lyanna Stark. We also get to see Jon and Daenerys Targaryen make love, and if you think about it, that means Jon is Daenerys’ nephew. With the two together, their armies will be even bigger with Jon being the King in the North and Daenerys having dragons and a huge army that she has amassed throughout the seasons. The two wanted to team up with Cersei Lannister to help defeat a bigger threat, the White Walkers. Of course, we can expect Cersei to plan something mischievous, as she’ll likely try to take them both out once the fragile alliance is over. Game of Thrones is based on the books by George R.R. Martin called A Song of Ice and Fire. He is still working on the sixth novel, The Winds of Winter. The post Game of Thrones Season 8 gets new teaser trailer along with release date appeared first on Nerd Reactor.